No matter who you are, how much you have, how successful you’ve become… there will always be something that could hurt you so deep and that is REJECTION which is an awful experience. No one likes to be rejected, denied or dumped. Sometimes it might feel like you are the only person that has ever felt rejection, which can be especially hard. Everyone has at some time or other experienced the painful sting of not getting what they really wanted… so don’t feel alone. Rejection is a fact of life and you will get through it by accepting it with a positive approach. If we always got what we wanted, then there would be no challenges to face, and life might be pretty uneventful, after all. Think about the rejection. If a top company doesn’t want you working for them, then do you really want to work for them? If a man says he doesn’t want a relationship with you, then why would you want one with someone who doesn’t want you? Rejection is very important in life and it leads us to where we are meant to be. It can put us on the right track and lead us to our dreams and goals. Appreciate rejection and remember to remain positive. The rejection is not always about you. You must consider outside reasons for this rejection. Try not to take everything so personally and beat yourself up about it over and over again. If you continue to say negative things to yourself you will become depressed and feel even worse. How about letting it go, getting rid of the negative thoughts and moving on. Make a list of how great you are and your best qualities. Sometimes when we are rejected, it is about our actions or nonactions. Maybe you said the wrong thing. Maybe you did something that someone else found unacceptable. If you did make a mistake, then take responsibility for your actions and then move on. If needed, apologize to this person. At other times we may have pushed too hard and demanded too much from someone, resulting in them leaving. If you didn’t do anything big, then let it all go. If this is a mistake you have been making for a long time, recognize this and make some changes to your approach. Learn from your rejections and work on yourself. When you get rejected, avoid beating up on yourself. 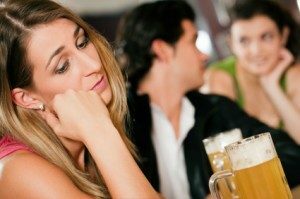 Many people get turned down by someone they fancied and then go on an all-night drinking binge with their buddies or hole up by themselves at home. Be kind to yourself after you have been hurt and treat yourself to a spa day or a special dinner with a friend. Talk about the rejection and get it off your chest. It is important to take care of yourself and stay positive when you have been rejected and to learn from the experience. If we always got what we wanted, then there would be no challenges to face, and life might be pretty uneventful, after all.